What do the estimates on the map represent? Our estimates show the average outcomes in adulthood of people who grew up in each Census tract (small geographic units containing about 4,000 people) and were born between 1978 and 1983. Importantly, many children move to different areas in adulthood, but we always map the data by where children grew up, regardless of where they live as adults. For example, a child who grew up in a tract in Minneapolis but moved to New York as an adult would still be included in the data for his or her childhood tract in Minneapolis. The data provide information on the average actual outcomes of children who grew up in each area. Each estimate is specific to a selected group of children from each tract, defined by their race, gender, and parental income level. For instance, one estimate might look at the outcomes in adulthood for black men who grew up in low-income families in a specific tract. How do these data differ from existing data on poverty and inequality in neighborhoods? Traditional measures of poverty and neighborhood conditions provide snapshots of income and other variables for residents in an area at a given point in time. But to study how economic opportunity varies across neighborhoods, we really need to follow people over many years and see how one’s outcomes depend upon family circumstances and where on grew up. The Opportunity Atlas is the first dataset that provides such longitudinal information at a detailed neighborhood level. Using the Atlas, you can see not just where the rich and poor currently live – which was possible in previously available data from the Census Bureau – but whether children in a given area tend to grow up to become rich of poor. This focus on mobility out of poverty across generations allows us to trace the roots of outcomes such as poverty and incarceration back to where kids grew up, potentially permitting much more effective interventions. These estimates of upward mobility are based on the outcomes of children born between 1978-83. Why? Are they still relevant for kids growing up in my neighborhood today? By necessity, any analysis of upward income mobility must be based on historical data, because one must wait until children grow up to see their earnings. We have found that it is necessary to wait until people are in their mid-30s to get reliable estimates of their earnings, which is why we focus on children before in 1983. However, we find in our accompanying research paper that places that produced good outcomes in the past typically tend to produce good outcomes a decade later. Moreover, historical outcome data prove to be much better predictors of outcomes than more recent data on poverty rates or test scores. Our estimates are thus highly informative predictors of economic opportunity even for children today, although they should be combined with additional analyses and on-the-ground knowledge in areas that have changed substantially. How do you produce these estimates? There are several steps in our estimation process. We begin with anonymized administrative data for 20 million children between 1978-1983 linked to their parents that is housed at the U.S. Census Bureau. We assign children to the tract (or tracts) where they spent time growing up. For children who grew up in multiple tracts, we assign them to tracts in proportion to the amount of time under the age of 23 they spent in each tract. We then use we use a statistical model to estimate the relationship between parental income when the children were growing up and each outcome. We estimate these models separately for each tract and for each race by gender group. The outputs from these models are the estimates shown in the Atlas. We use outcomes for children at all levels of parental income to help predict the average outcomes for children at any parent income level. For instance, we combine data on the outcomes of children whose parents are at the 20th and 30th percentiles to help form an estimate of outcomes for children with parents at the 25th percentile. However, estimates for children of a given race or gender rely only on data from children of that same race and gender. For example, we rely only on observed data for black men to produce estimates for black men. Similarly, we rely only on data from a single tract to produce estimates for that given tract. For more detail on such methods, please see our more detailed Atlas Methodology page. Who built the Opportunity Atlas? The Opportunity Atlas is an initial release of social mobility data, the result of a collaboration between researchers at the Census Bureau and Opportunity Insights (a research and policy group based at Harvard University). Any opinions and conclusions expressed are those of the authors and do not necessarily reflect the views of the U.S. Census Bureau. Where can I see a list of all the features and functions of the Atlas? See the comprehensive user’s guide or watch this tutorial. Is it possible for me to save what I am looking at as I work with the Atlas or zoom in to a specific area so I can share with my colleagues or friends? You can save map images and download the data as you go. Just click the link icon that appears in the lower left-hand corner, below the neighborhood characteristics. I want to look only at certain neighborhoods, for instance leaving out places that would be unaffordable to low-income families. How can I do this? Go to Advanced Mode by clicking the menu icon you see near the upper left next to the map. In this mode, you can filter out which estimates appear on the screen based on children’s outcomes or neighborhood characteristics. Begin by selecting a characteristic and dragging your mouse over the range of the variable you want to examine. This lets you hone in on neighborhoods with specified characteristics (e.g., average rents below $1000 month). You can also filter on multiple characteristics (e.g., rent and poverty rates). You can then examine outcomes within your filtered results. What happens if I change something, like the selected outcome measure, while filtering tracts? The filtering tool remains until you remove it, even when you change your selected outcome measure or toggle between different demographic subgroups. How can I see what filters I’m using, or get rid of one I don’t need anymore? Whenever a filter is in use, a green tile appears below the radio buttons in the upper right-hand box to remind you exactly how the data are filtered. You can remove filters by clicking on the “x” icon on the green tile. Can I overlay my own dataset and, if so, how? Yes! You can use the “Overlay your Data” option – located in the bottom left-hand side of the screen – to overlay your own geographic data onto the Opportunity Atlas. You can identify locations by geographic coordinates (latitude and longitude), address, or tract identifier. You can also upload your own boundary file to overlay custom boundaries on the map. How should I use the zoom function, and how does it change the scale? You can use the zoom function to look more closely at Census-tract level outcomes throughout the country. The colors for the “everyone” and the “selected group” scaling options do not change as you zoom in and out, but the “on screen” color scaling will change to reflect only the geographic areas on your screen. How do the different scaling functions work? The “everyone” option scales colors to compare the whole nation. With this scale applied, the full spectrum from red to blue is applied to the entire nation, covering children from all incomes, races or ethnicities, and genders. For example, low-income white men would be compared to everyone, including high-income white men, Asian men, etc. Red colors here represent average outcomes that are lower than the national average, including all kids; blue colors represent average outcomes that are higher than the national average, including all kids. The “on screen” scaling feature changes the map’s coloring so that the range from red to blue covers the exact range of estimates fully or partially visible on the map. Though the colors on the map change, the underlying data always remain the same. The “on screen” coloring simply helps to show local variation more clearly. The “selected group” option compares outcomes for the selected subgroup at the national level. With this scale applied, the full spectrum from red to blue covers the demographic group you are currently examining (e.g., Asian men with middle-income parents) at the national level. Again, the underlying data never changes. Red colors here represent average outcomes that are lower than the national average for the selected group; blue colors represent average outcomes that are higher than the national average for the selected group. We recommend using local color scaling if you want to analyze variation within a small area; selected group scaling if you want to get a national perspective on how outcomes compare for a given demographic group; and national scaling if you simply want to compare everyone in the U.S. on the same scale. Why do you display predicted outcomes instead of observed outcomes? The predictions we display are based on actual outcomes of kids who grew up in each geographic area. Our prediction model accounts for the fact that we do not observe children at every single parental income level in every single tract and demographic subgroup. For instance, we may observe individuals in a given tract and subgroup at low and middle levels of parent income, but not high levels of parent income. Our statistical model allows us to predict the likely outcomes of children from these higher income families. For more detail on how we form these predictions, see the Atlas Methodology page. Why does the estimate I see for a certain tract/subgroup/outcome seem very high, very low, or just unrealistic? Overall our estimates are highly accurate, with small margins of error. However, since we report estimates for 70,000 neighborhoods, it is to be expected that some estimates may be less reliable. Specifically, our estimates include error from two distinct sources that may cause specific estimates to seem unrealistic or unrepresentative in certain cases. First, some of our estimates are based on relatively few individuals. Since it is more likely in this case to randomly have a very high- or low-outcome individual that skews the sample, these estimates can be less reliable. Second, to protect privacy we add small random numbers (known as “noise”) to all our estimates to protect the privacy of individuals associated with each tract. This “noise” is typically quite small and does not affect the estimates meaningfully, but it can sometimes have a disproportionate effect on tracts with few children. For these reasons, specific estimates should be interpreted with caution, particularly in small subgroups and for selected outcomes where we display warnings that margins of error may be high. Additional information on these issues is available at our Atlas Methodology page or in the research paper. There are no low-income families in my neighborhood; yet you have an estimate for how kids from low-income families who grew up there do. How is this possible? Our estimates are based on a statistical model that relates the actual outcomes of kids who grew up in each area to their parents’ income. Suppose we observe individuals in a given tract at middle and high income levels of parent income, but not low levels of parent income. We fit a statistical model (essentially a best-fit line relating kids’ actual outcomes to parental incomes) to extrapolate and predict how kids in low-income families would do if they grew up in that area. This extrapolation naturally relies on the validity of the statistical model and hence should be interpreted more cautiously than estimates where we have data on families at the relevant income level directly. For more detail on how we form the predictions, please see the Atlas Methodology page. Why don’t the neighborhood names on the map match what I know about my area? Mapping neighborhood boundaries is a complicated process. We use information from Google Maps to identify places. Since these names are generated from computer algorithms and databases, the names may not always match up with what you know about the area. How many individuals typically live in a Census tract? On average, about 4,000 people live in a given Census tract, with populations ranging from 1,200 – 8,000 people depending on neighborhood density. As we are focused only on children born between 1978-83 who grew up in each tract, our tract-level outcomes for all children rely on an average of about 500 children, with individual tract populations ranging from 150-1000. Estimates specific to a particular race and gender rely on an average of about 130 children, with tract populations within demographic groups ranging from 20-1000. Why are some areas shown in grey with “Insufficient Data” instead of an estimate? We do not publish estimates that rely on fewer than 20 children. Especially in demographic subgroups, some areas are grey because there are not large enough samples to yield reliable estimates. How do the estimates account for inflation? We adjust all dollar values for inflation to make them comparable across time. We use the consumer price index (CPI-U) to report amounts in 2015 dollars (the most recent year included in our data). Does parental income rank change over time, or is it fixed based on a point in time? We define parental income based on household income at a fixed point in time – the first five years that we can link children to parents and observe parent income in our data (1994-1995 and 1998-2000). Previous work has explored the consequences of measuring parent income in different years, or in a way that changes over time. Those results suggest that our estimates would be very similar if we were to measure parental income at other points in time. Is it problematic to measure parent income when those parents’ children are closer to adulthood? No; as mentioned above, our prior research shows that our estimates would be similar if one measured parental income at earlier ages. Why do individual and household incomes differ? Individual incomes incorporate exclusively one person’s income, while household income sums individual incomes across spouses. Why do many metro areas look like a solid color on the national map, but appear more varied when you zoom in to look at individual neighborhoods? When viewing the Atlas at a very zoomed-out level, we present estimates at the level of the metro area (specifically, by Commuting Zone). As you zoom in, the Atlas displays estimates at the county and then the Census tract level. So, when the map is zoomed-out to a national scale it essentially displays city-wide averages. Since there are usually high- and low-opportunity areas within every city – one of the key findings of this new research – the tract-level estimates show much more nuance. Do you recommend comparing outliers as a way of better understanding why some neighborhoods outperform others? Outlier tracts can be a powerful tool to understand the drivers of children’s outcomes, but it is important to make sure that an outlier reflects a truly high- or low-outcome tract, as opposed to random fluctuations in an estimate with a large margin of error. If you focus on a single tract, we recommend that you make sure there are a relatively large number of children being used to the form the estimate you are looking at (at least 50 children) by using the “Number of children” variable. Another way to make sure you are identifying stable patterns when examining outliers is to look for small clusters of neighborhoods instead of basing conclusions on individual Census tracts. What do you mean by parent income percentile? Children’s income percentile? Instead of relying on the raw level of income in dollars, we run our statistical models (for both parents and children) by converting incomes into percentile ranks. For example, we rank children born in 1980 relative to all other children born nationally in 1980 based on their incomes to obtain percentile ranks for children born in 1980. Similarly, we rank parents relative to all other parents with children born in the same year. A percentile rank of 75 means that a child earns more than 75% of his or her peers. For ease of interpretation in the Atlas, we then convert income ranks back into dollars when looking at children’s outcomes. We focus on percentile measures in our models because previous research shows that income percentiles (but not dollar amounts) are stable once someone reaches roughly age 30. Thus, the income percentiles we observe when children are in their mid-30s in 2014-2015 are likely similar to these people’s outcomes in later years. 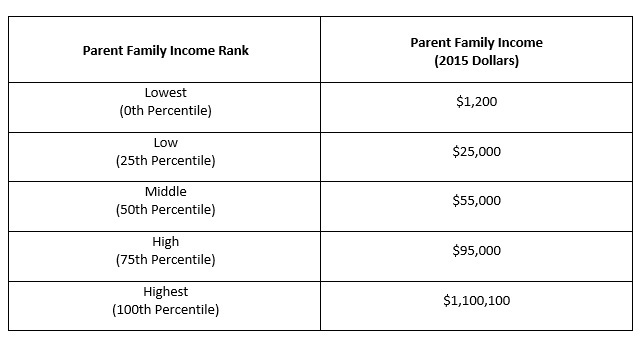 How rich are “low income” parents? “High income” parents? We present estimates for children in three core parental income groups in the standard version of the Atlas: Low (25th percentile), Middle (50th percentile), and High (75th percentile). In Advanced Mode, users can access estimates for parents in the Lowest (0th percentile) and Highest (100th percentile) income groups. You can use the table below to get approximate dollar values for each of these percentile ranks, though there is some variation across birth years. There is an overwhelming amount of data here. I’d like some guidance on what I can learn from this tool. Where can I go? We recommend starting by viewing the stories that illustrate lessons we have learned from the Opportunity Atlas in different regions of the country. Just click the teardrop icons that appear on the map across the country when you are viewing the national map (click the icon of the U.S. map in the lower right to get to the national view). Or, if you have a specific question or want advice on how to get started in your area, contact us. If data is loading slowly is there anything I can do to improve the speed? You can try refreshing the page, closing other open browser tabs, or removing any outcome filters that may be slowing down the tool. If I find a problem with the Atlas, who can I contact? Please send inquiries regarding any technical issues that you find within the Atlas to [email protected] If you are seeing a bug, others may be too, so we want to hear from you! Although the estimates in the Opportunity Atlas are not provisional, we are still testing aspects of the research product, including census.gov integration, planned annual data refreshes, and variable additions. All results have been reviewed to ensure that no confidential information is disclosed. The statistical summaries reported in this paper have been cleared by the Census Bureau’s Disclosure Review Board release authorization number CBDRB-FY18-319. Any opinions and conclusions expressed herein are those of the authors and do not necessarily reflect the views of the U.S. Census Bureau.